A macaroon is a type of light, baked confection, described as either small cakes or meringue-like cookiesdepending on their consistency. The original macaroon was a "small sweet cake consisting largely of ground almonds" similar to Italian or Moroccan amaretti. 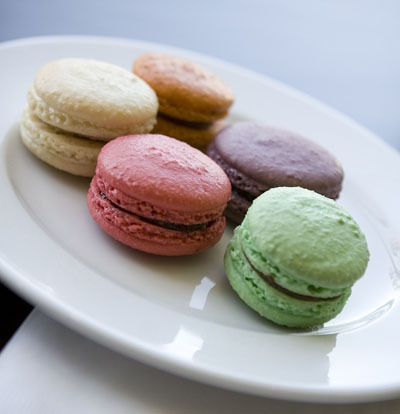 The English word macaroon and French macaron come from the Italian maccarone or maccherone. This word is itself derived fromammaccare, meaning crush or beat, used here in reference to the almond paste which is the principal ingredient. Most recipes call for egg whites (usually whipped to stiff peaks), with ground or powdered nuts, generally almonds. Alternatively, coconuts can be used. Almost all call for sugar. Macaroons are sometimes baked on edible rice paper placed on a baking tray. Dessert is a course that typically comes at the end of a meal, usually consisting of sweet food but sometimes of a strongly-flavoured one, such as some cheeses. The word comes from the French language as dessert and this from old French desservir, "to clear the table" and "to serve." common desserts include cakes, cookies, fruits, pastries, ice cream and candies. The word dessert is most commonly used for this course in U.S., Canada, Australia, and Ireland, while sweet, pudding or afters would be more typical terms in the U.K. and some other commonwealth countries, including India. According to debrett's, pudding is the proper term, dessert is only to be used if the course consists of fruit, and sweet is colloquial. This, of course, reflects the upper-class/upper-middle-class usage. More commonly, the words simply form a class shibboleth; pudding being the upper-class and upper-middle-class word to use for sweet food served after the main course. Desserts are often eaten with a dessert spoon, intermediate in size between a teaspoon and a tablespoon. Ni sume produk2 yg first time aku wat..saje suke nk cube..kebanyakan tempahan untuk kek & hantaran,aku amek dari kalangan sedara jek..aku jadikan diorang platform utk aku mencuba..lbih kurang mcm bahan ujikaji ah..hehe..kalo korang nk tau pe produk2 ni dgn lbih lnjut,bukak page 'bAkEry prOdUct'..bg ah pape komen utk bdk baru blaja ni..huhu..
Cecitenye..mule2 dulu aku ni x ah minat sgt hal yg berkaitan dgn ‘bakery’ ni..tp stakat nk tunjuk skill wat kueh raya tuh,adalah sket2..hehe..dulu aku ni amek jurusan ‘architecture’ kat ILP KL..mcm gah jek bunyinye an..tp akhirnya kecundang di tgh jln..kecundang gara2 rancangan ‘SUGAR’ kt astro..ahaha..ala,spe2 yg ske tgk channel ‘travel n living’(skang TLC or AFC),msti tau rncangan ‘SUGAR’..aku xtahan ‘godaan’ penghasilan produk bakeri dlm rncangan tuh..anna olsen tuh mcm magician..bhn2 yg die gune sume simple2 tp die leh hasilkan produk bakeri yg leh wat air liur ‘kite’(‘kite’ ni sbenanye mrujuk kpd adek2 aku) ni meleleh jek mcm org mengidam..hehe..akupun terpikir ah pulak..kalo aku try bidang bakeri ni,agak2nye berbaloi x utk mase dpn aku..hm..lme gak aku nk amek mse utk pk smpi last2 aku trbace dlm paper psal twaran blaja sijil bakery&confectionery kt giatmara..akhirnye,akupun tercampak ah kat GIATMARA PANDAN,SELANGOR..di situ ah bermula kisah pengembaraan aku dalam bidang bakeri ni smpai ah skang aku da dpt smbung blaja kat FOOD INSTITUTE of MALAYSIA,KELANA JAYA..so,kalo korang nk tau pe cte pngembaraan aku ni,korang teruskan view blog aku..korang pasti jmpe ‘something’ yg xternilai di sini..huhu..pe agaknye?? ?tunggu !!!!! !